This piece is an interactive sound installation. The title itself is a wordplay : “I-Ran” making reference to the Iran, country from Middle-east known for its political leader Mahmoud Ahmanidejad, and the sentence : “I ran” like a metaphor of the resistance and popular strikes and riots. 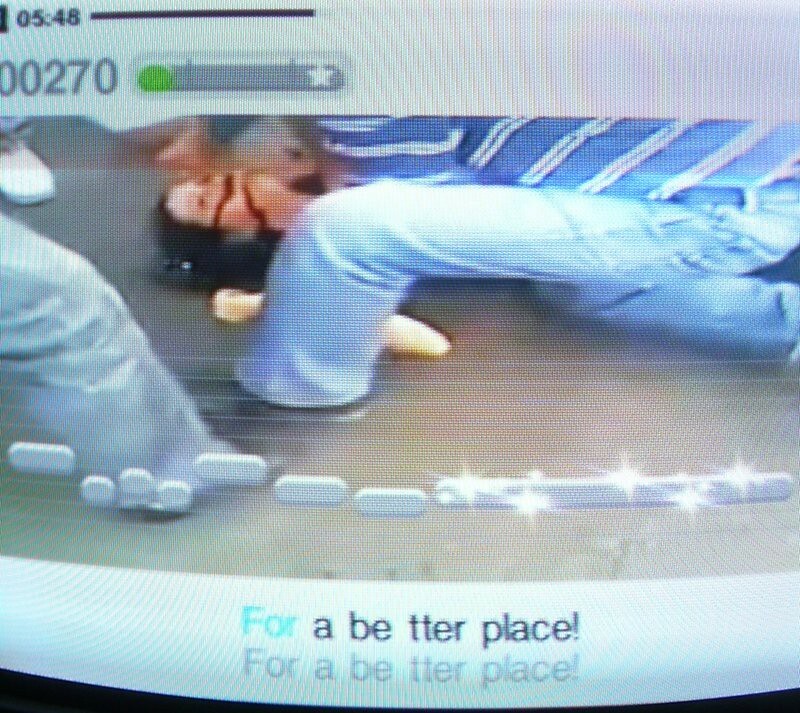 “I-Ran” consists in a playstation 2 hack and more precisely a hijacking of the karaoke videogame: “Singstar”. The idea of this game is simple, the better you sing, the higher you score. Then you’ll get the maximum of chances to become a star. With this friendly game, the players can confront themselves to the others integrating their bodies and personal abilities in the sing challenge. “I-Ran” is contextualised in regard of the iranien situation in june 2009. Strikes happened in Iran and still continue today. Citizens rally against the shady reelection of Mahmoud Ahmanidejad. The repression has been terrible, merciless. The local medias opposed to the Ahmanidejad regim were forbidden and the foreign medias evicted. The violent repressions and the numerous deaths which resulted from these events could have been publicized and denounced thanks to the internet and social networks. Twitter, among other webservices publishing information in real time, has been used by the iraniens to relay what happened in their country. Unfortunately, almost at the same time, Michael Jackson, the most famous pop star, died. Trough the same information channels, Iran disappeared of the informations streams on account to Michael Jackson. 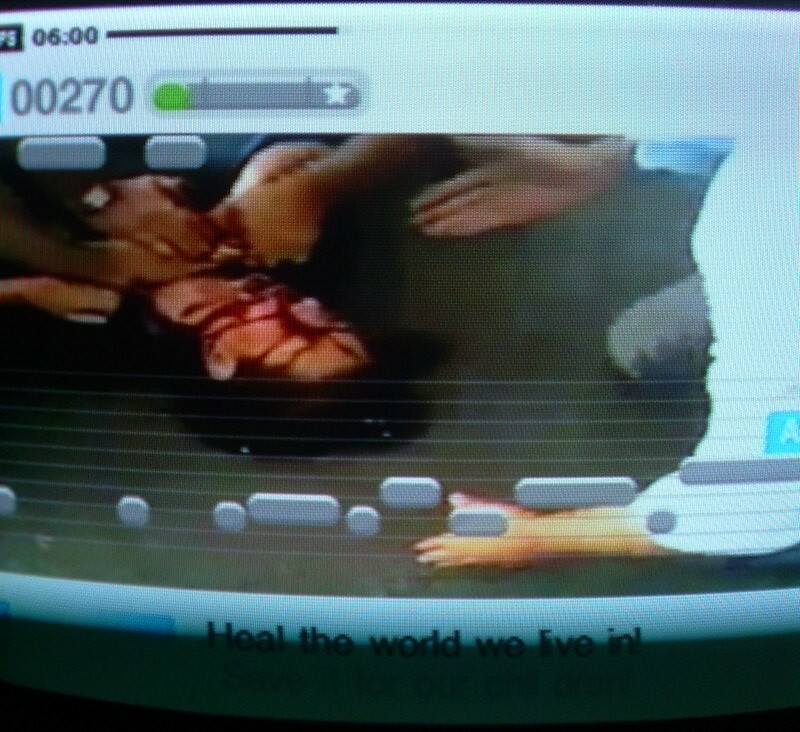 This piece: “I-Ran” transforms the Singstar game. 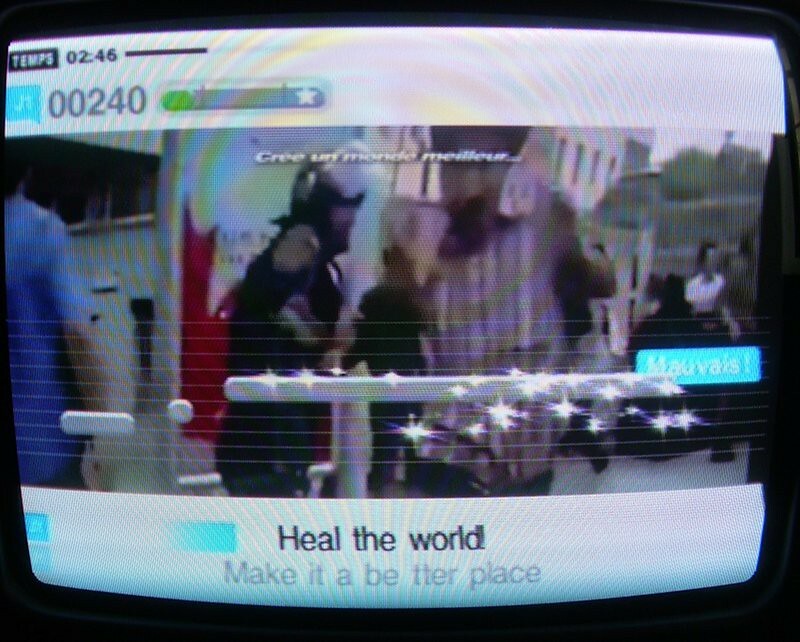 A song of the famous singer is integrated within the game, “Heal the world”. 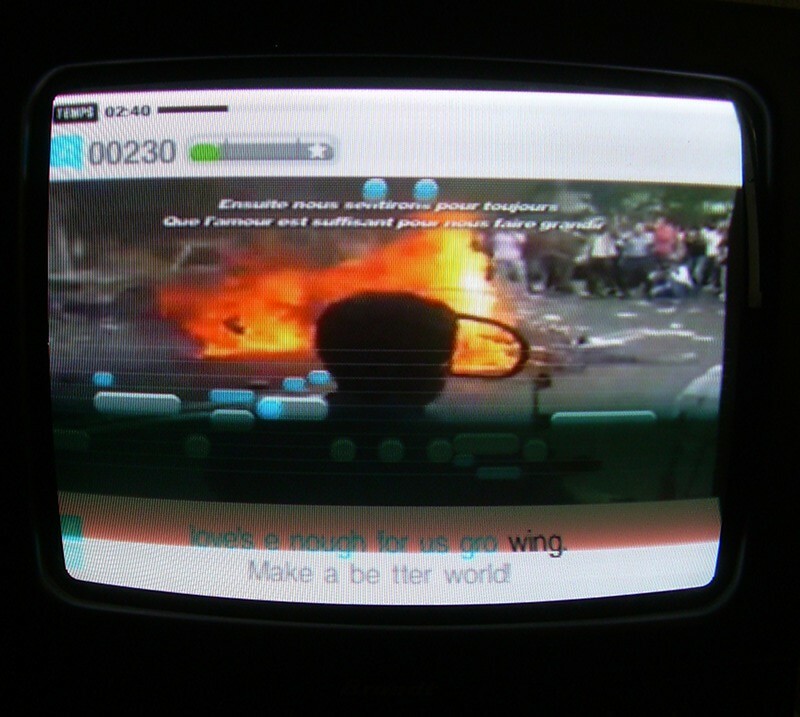 The song, characterised by humanitarian and egalitarian intentions, is accompanied with a video. This one is only made with extracts of videos made by Iraniens in the street with their cellphones. The videos have been broadcasted to the internet after and that’s the real and precious insight we can get now about the situatio in the country. But, the more the spectator in the installation sings, the more he will see a horrible video. We didn’t decide to show from the stary something unbearable. We wanted to show that a simple revolution begins as well in the street. And going in the street to express its anger and indignation is already a dangerous action likely to send the citizen in the jail or to death. That’s why the video is edited with a growing tension but the reality isn’t beautiful nor easy to watch. That’s why, the player choose to watch the video or decides only to play. The addiction to fun is a metaphorical system used to describe our society. We think then that this piece is important because it doesn’t condemn the situation in Iran. It questions our relationship to the information, the medias and how we react to the horror around us. This installation is more a work about how the medias manipulate or concentrate the informations, without empathy nor concerns, and how we decide to include ourselves within this coercive dispositive.